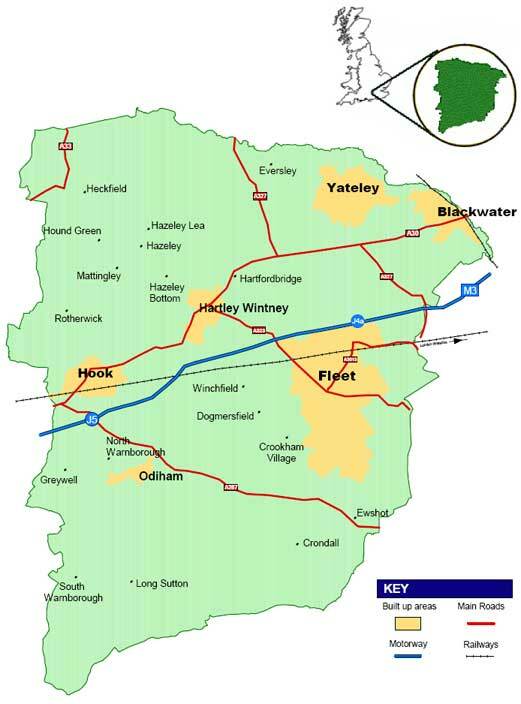 The Hart district is well located in the north-east corner of Hampshire and takes its name from the little River Hart which flows through its centre. The district has good methods of transport and links to some major cities in the south including London, Woking, Southampton​, Bournemouth and Portsmouth. The M3 motorway passes through the district. Junction 5 at Hook, and 4a at Minley near Fleet. The M4: Junction 11, located 12 miles to the North, near Reading, is easily accessible. For bus times please visit the Stagecoach bus website. Mainline trains to London (Waterloo) in 40 minutes, and also to Basingstoke, Winchester, Southampton and Bournemouth from the stations at Fleet, Winchfield, Hook. Trains to Reading and Guildford from the station at Blackwater. Directions from Fleet Station to Fleet Town centre. London Heathrow Airport: 45 minutes by road. Gatwick Airport: 1 hour by road. Blackbushe Airfield: On the A.30. Local for light aircraft. Southampton and Portsmouth Docks: 1 hour by road (M3).